Within hours of finishing the marathon on Sunday, I was contemplating doing another one. Before Chicago. Soon. I wanted redemption. I wanted a faster racing time so I can FOR SURE go to Boston next year. * Most of all I wanted a do-over, because I was disappointed in my mental performance and how I gave up when things got tough. So I contemplated – very seriously – switching to Grandma’s marathon (I’m already in Grandma’s half marathon and have my hotel room booked for that weekend). But then, fortuitously, the entry in my daily meditation book (Journey to the Heart by Melodie Beattie; SO awesome for people going through divorce or, really, any sort of life change) spoke to me. These entries speak to me even more than Dove dark chocolate speaks to me. 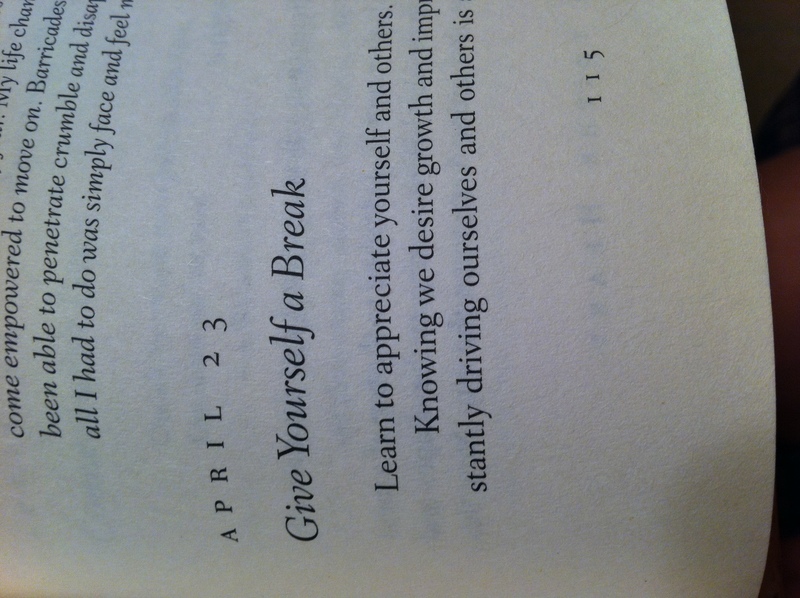 The entry was titled “Give Yourself a Break”. Anyone else think it’s freaky that this entry came the day after the marathon, right as I was beating myself up and contemplating tackling another marathon in less than 8 weeks? See what I mean? It spoke to me. I’m pushing myself too hard. Risking injury if I do another marathon now. I’ve pretty much been in marathon training for 4 years now, with last year being the most intense, with 3 marathons. I love it, but I probably do need a break and don’t NEED to do another one right now. So I AM going to give myself a break and stick with my original plan, which is to do Grandma’s half. And now, when I think about it, I really like that plan, because doing a half marathon won’t take as much out of me, it will make me focus more on speed (which actually may help my marathon time, in the long run). And, most importantly, it will allow me to relax and ease up a bit over the next couple months, which is much needed. Plus, Duluth is so fun on marathon weekend that just doing a half will allow me to really have fun up there. So, for the curious, my plan is to jump into the Grandma’s Advanced Half Marathon training plan schedule next week (but modify it way back, so I can continue to recover as necessary). And I’m actually excited about this new diversion! *I have already qualified, with 2 minutes 39 seconds under the new, harder, standard for 2013. So I’m pretty sure this should get me in (since last year the cut off was 1 minute 14 seconds under who made it, but this year the standards are 5 minutes faster). BUT – you never know. It seems like runners everywhere are working harder and getting faster. you’ll get into boston. only 400+ people took the deferment so that won’t affect you. you are doing the right thing. doing another marathon so soon (racing another marathon i should say) will get you nowhere and you may end up more disappointed. I was having a conversation about this myself last night. I’m worried that because of my injury my October marathon in Detroit won’t be what I hoped, and I am tempted to sign up for not one but *two* in the winter. Really, I shouldn’t be worried about that yet. Obviously I need a break to work on my back.